Here I come with my latest mixed media on Water color Paper. I started this project from scratch with plain paper and made this Background with watercolor. In this layout I didn't use lots of layers and embellishment just because I want to highlight my background. 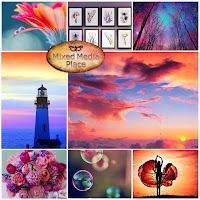 I inspire with the light house and those beautiful clouds as well as color of mood board. Wow- I am impressed on how you did catch the colors on the photo.